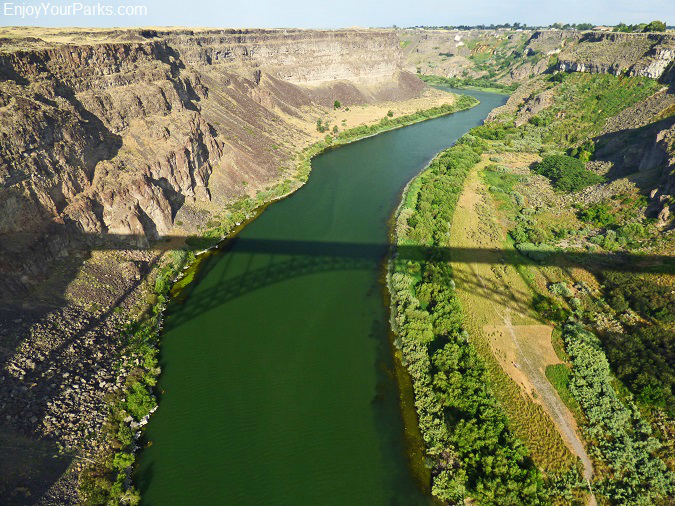 as the "Niagara of the West", as well as the incredible Snake River Canyon and Perrine Bridge. 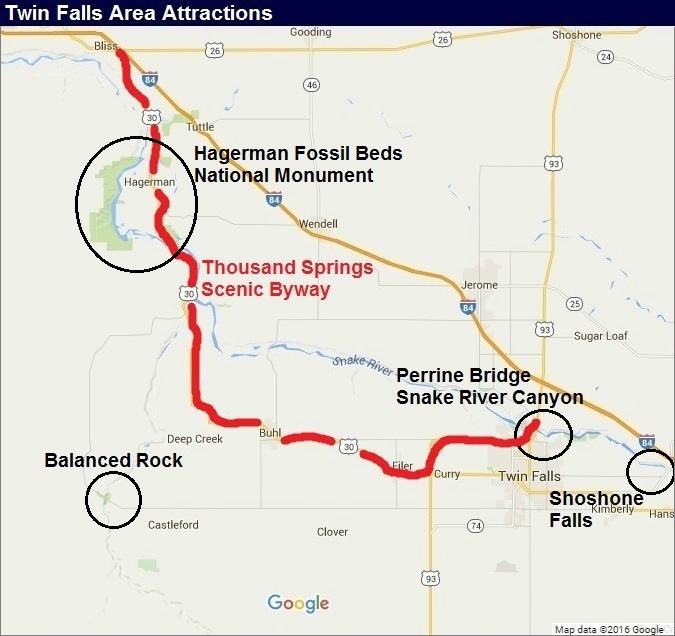 Twin Falls also marks the beginning of the Thousand Springs Scenic Byway, which takes its visitors through amazing scenery, numerous National and State fish hatcheries, as well as the famous Hagerman Fossil Beds National Monument. And just south of Twin Falls, along a wonderful two lane paved road through charming farm county, is the fascinating Balanced Rock which is indeed a geological wonder. 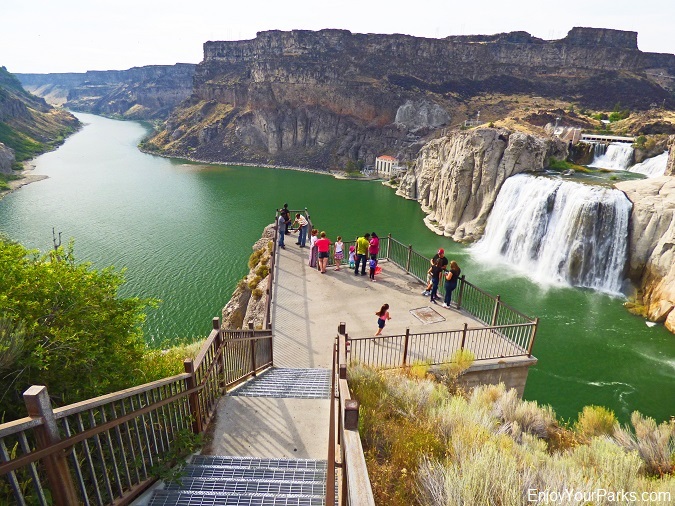 Of course there are many more things to do and enjoy in the Twin Falls that we won't be mentioning on this page, but we want to keep our website dedicated to what we feel are the very top attractions of Idaho. 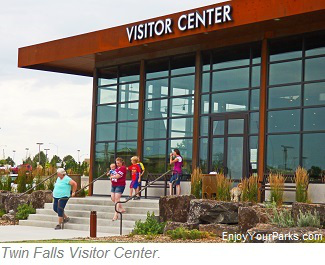 For more information on the Twin Falls Area, there is the absolutely fantastic Twin Falls Visitor Center located near the Perrine Bridge that will help you with all the attractions available in the Twin Falls Area. 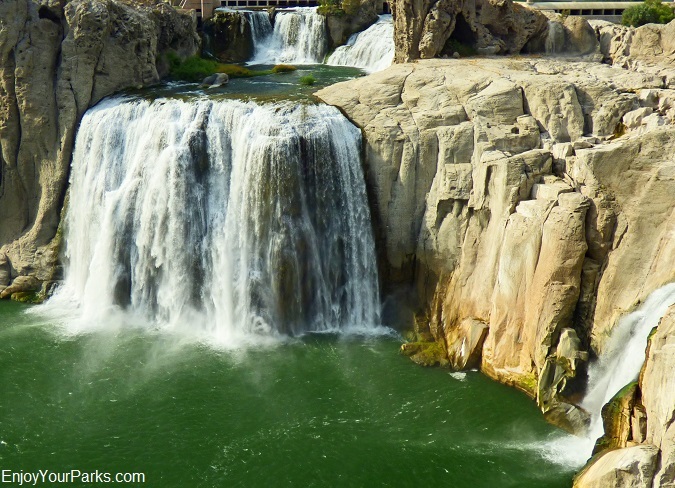 Shoshone Falls is among the major attractions in the Twin Falls Idaho area. 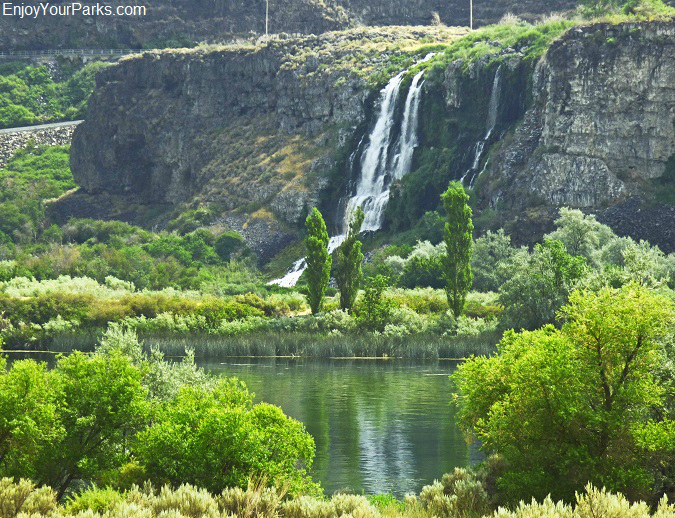 Twin Falls is home to one of the most gorgeous water falls in the West. Shoshone Falls is known as the "Niagara Falls of the West" for good reason....they are stunningly beautiful and are a definite "must see"
while vacationing in Idaho. At 212 feet in height and 900 feet wide, Shoshone Falls is higher than Niagara Falls, and there are several incredible vantage points that will take your breath away. dollars, and is worth every penny. 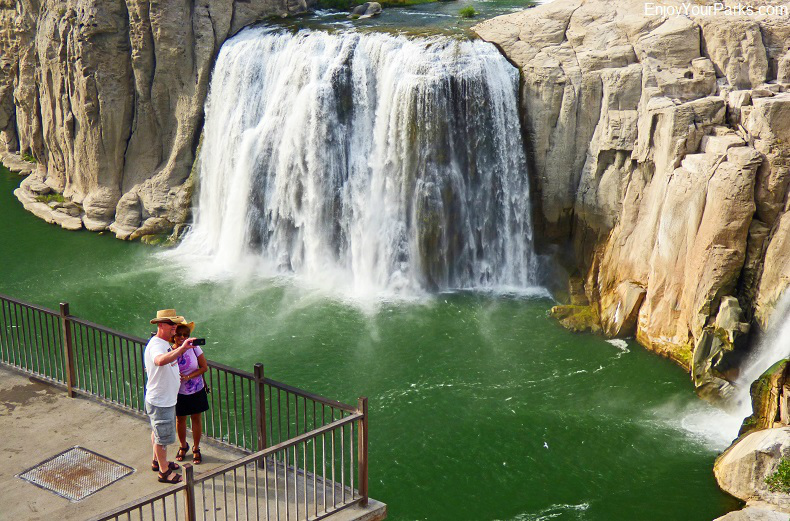 Shoshone Falls Park provides unbelievable views of Shoshone Falls from the Shoshone Falls Overlook, as well as playgrounds, picnic areas, a boat ramp, swimming area. 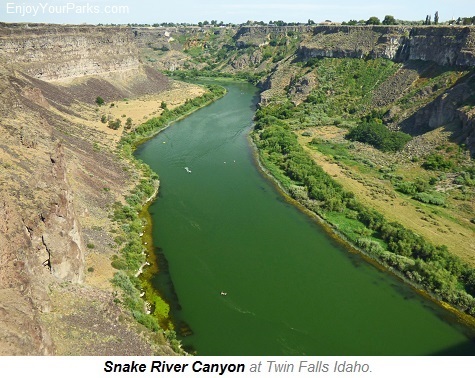 There are also terrific hiking trails that will take you along the amazing rim of the Snake River Canyon, which with each turn the view of the falls changes dramatically. This is also the location of the famous attempt by Daredevil Evel Knievel to jump across the Snake River Canyon on September 8th, 1974. The Shoshone Falls Overlook provides an exceptional view of the Snake River Canyon as well as Shoshone Falls in Twin Falls Idaho. 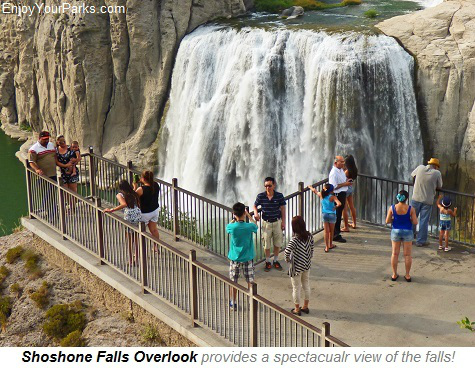 Shoshone Falls is without question one of Idaho's Top Attractions. However, visitors must keep in mind that the glory of the Shoshone Falls is directly dependent on how much water is flowing over them. During the summer months, if there is a low snow pack in the mountains to the west, and/or there is not a lot of precipitation in the form of rain, then Shoshone Falls is not quite as dramatic as it is during the spring of the year (May, June) during the spring run-off. 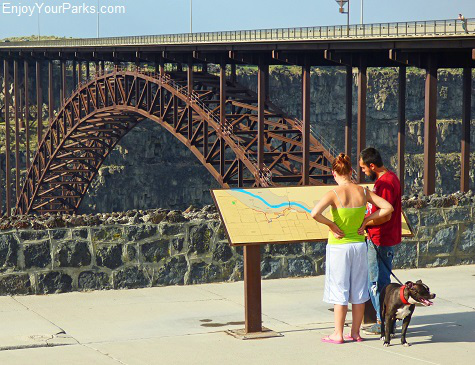 The water flow is controlled by the folks who run the dams up stream, and one only hopes they are generous during your visit to Shoshone Falls. The I.B. 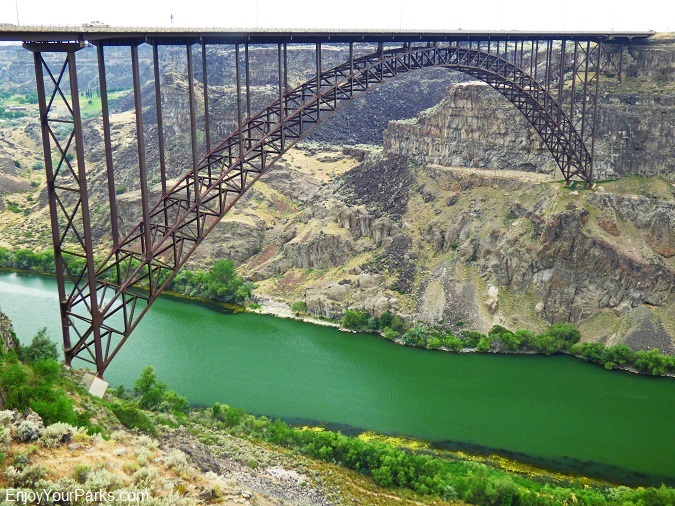 Perrine Bridge in Twin Falls Idaho crosses the mighty Snake River Canyon just north of the main link between Twin Falls and Interstate 84. Located only about a half mile south of Interstate 84 on U.S. 93, this amazing truss arch four lane bridge is 1,500 feet long and 486 feet high. 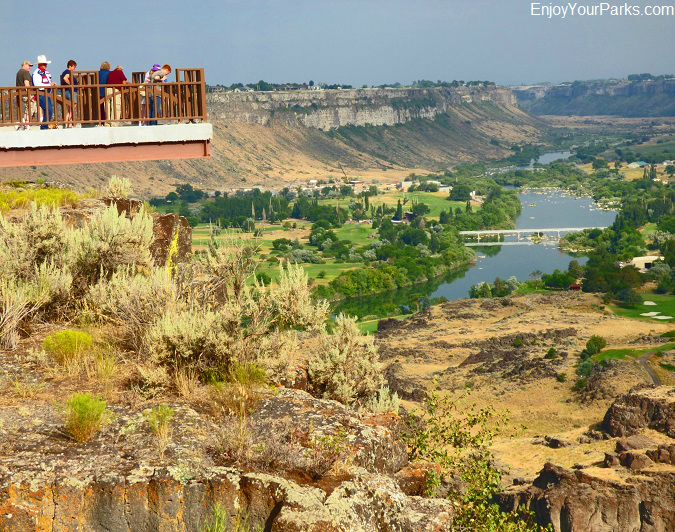 There is a visitor parking area on the north end of the bridge, which takes visitors underneath the bridge and allows them to gaze down upon the Snake River found nearly 500 vertical feet below in the remarkable Snake River Canyon. If visitors are lucky, they will also get to watch "base jumpers" literally jump off the I.B. Perrine Bridge with special parachutes. The I.B. Perrine Bridge is 486 feet high and 1,500 feet long, and stretches across the magnificent Snake River Canyon at Twin Falls Idaho. Located on the south end of the I.B. Perrine Bridge is the Twin Falls Visitor Center. 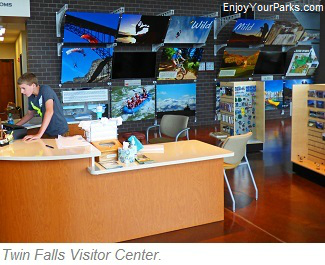 This absolutely top-notch visitor center is a must see during your Twin Falls Area visit, and is also where the I.B. Perrine Bridge Overlook is located. This outstanding overlook provides incredible views of not only the I.B. Perrine Bridge, but also the Snake River Canyon in general. 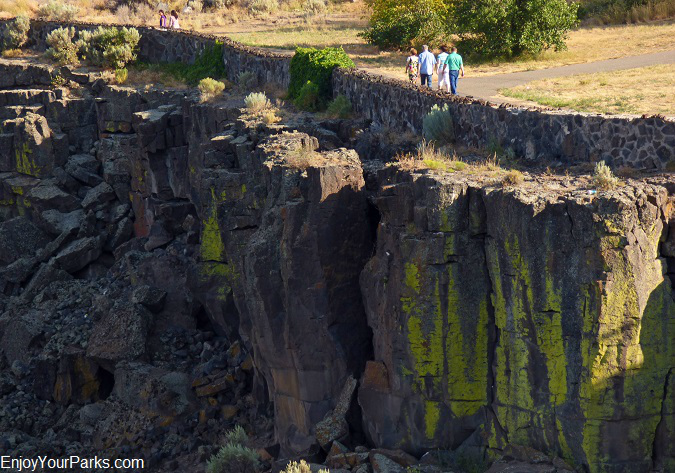 The Snake River Canyon Rim Trail is an extremely well designed trail system that provides outstanding views of the Snake River Canyon in Twin Falls Idaho. 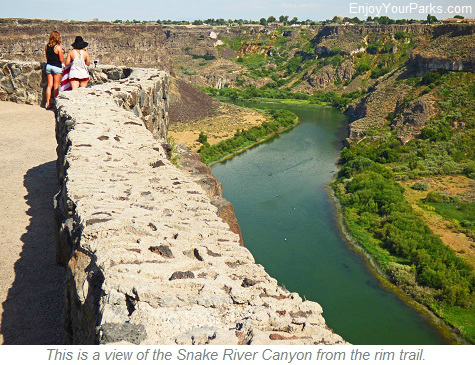 There are breathtaking overlooks along the Snake River Canyon Rim Trail System in Twin Falls. Ever thought of jumping off a 486 foot high bridge with a parachute on your back? Well, your dream can come true at the I.B. Perrine Bridge. The I.B. 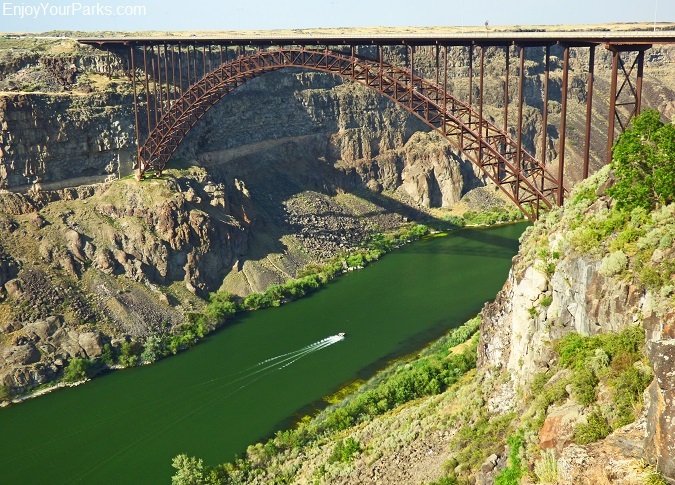 Perrine Bridge is one of the most popular BASE jumping sites on earth. Besides the Perrine Bridge being an absolutely perfect place to BASE jump, the City of Twin Falls does not require a permit to jump. 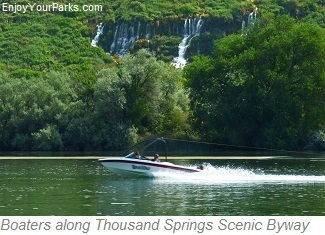 This further lures jumpers from across the globe to enjoy this high adrenaline sport. BASE jumpers come from all over the world to jump off this 486 foot high bridge, and visitors who have good timing will get to watch these brave adventurers do their thing. 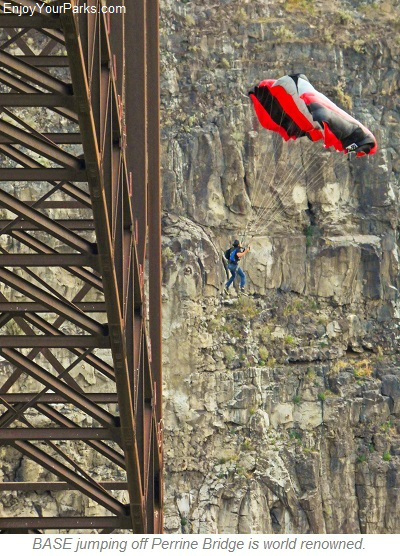 These BASE jumpers will walk along the walkway on the top of the Perrine Bridge to the bridge's center point, and jump off the bridge to the east. Shortly after these thrill seekers jump, their parachute will open (hopefully and usually) and they will float to a "landing pad" on the south shore of the Snake River. It's truly a thrill to watch these thrill-seeking BASE jumpers jump off the I.B. Perrine Bridge, and it will be one of your highlights during your Twin Falls visit. 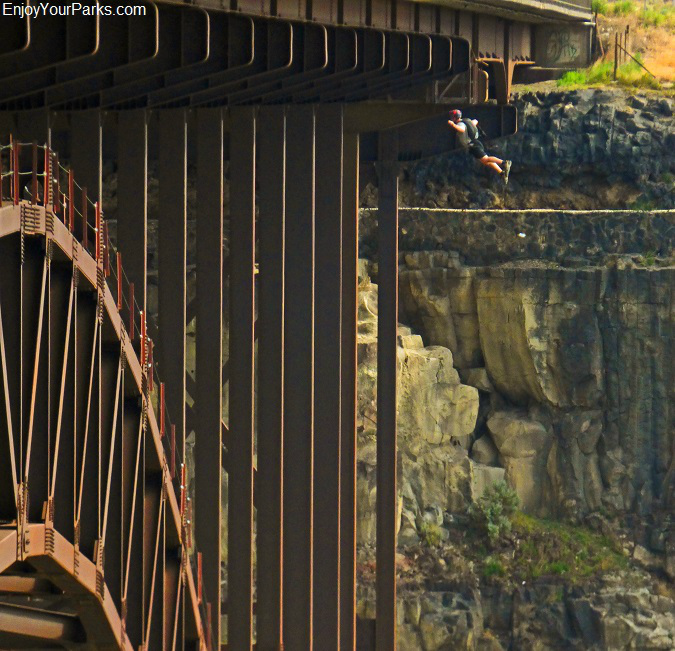 BASE jumper leaping off the Perrine Bridge...the Snake River is 486 feet below him! This is the view from the Perrine Bridge to the east...and is what BASE jumpers see before they jump! Located south of Twin Falls Idaho, just west of Castleford, Idaho is the geological marvel of Balanced Rock. Your first question that you'll ask yourself or whom ever you are with is, "When will this rock fall off its pedestal?" Balanced Rock is a 40 ton rock that is balanced perfectly on a base that is only 36 by 16 inches, and has stood there for thousands of years. This 48 foot high, 40 foot wide rock is known by the locals as "The Eighth Wonder of the World", and we tend to agree once you see it just sitting there on its tiny base. 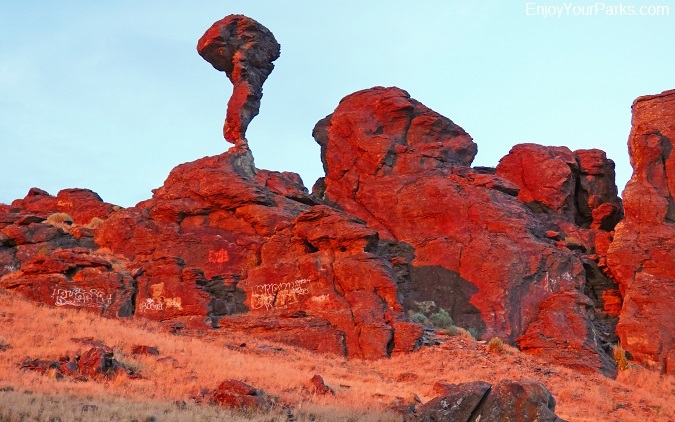 Located about 30 miles west of Twin Falls at the end of a myriad of two lane paved roads through beautiful farm country, Balanced Rock isn't exactly on the "main drag", but is definitely worth your while if you and your family are interested in fascinating and unusual geological structures. 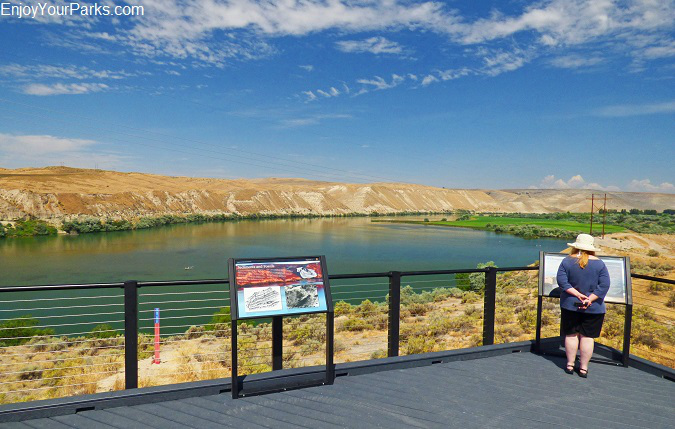 By far the easiest route is to take the road from Twin Falls to Buhl Idaho, and then follow the signs through 16 miles of a zig zagging route through classic Idaho farm country to Castleford. Follow the signs carefully to Castleford, and then onward to Balanced Rock. You will think you are heading into the middle of nowhere and you might feel like you're lost, but IF YOU FOLLOW THE SIGNS to Castleford and then to Balanced Rock, you will reach your destination. Just before you reach Balanced Rock the road will enter a tremendous canyon created by Salmon Falls Creek. Only about a half mile beyond the entrance to this steep walled canyon will be Balanced Rock, waiting patiently for you. The campground at Balanced Rock provides toilets, picnic tables, shelters, water and campsites, however there are no RV hookups and larger RVs may have a difficult time navigating the campsites. Groups can rent the group pavilion if they wish. As of 2015, there are no entry fees to use this campground. 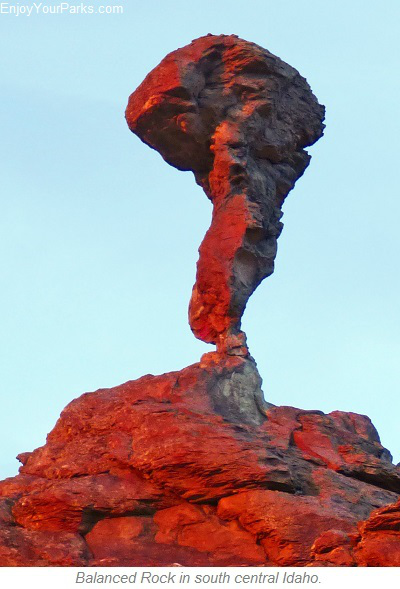 Balanced Rock with the evening sun creating a red alpenglow. 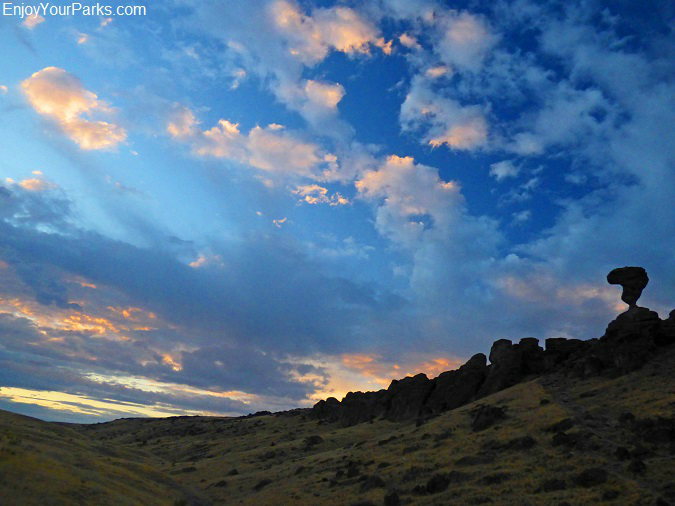 Balanced rock at dusk in south central Idaho. and then heads northwest through farm country and fascinating natural springs that are a result of a giant aquifer that seeps to the surface of the earth along this scenic roadway. 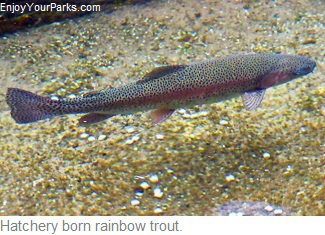 There may not be a “thousand springs”, but there are plenty of springs to create one of the most important fish hatcheries in the country. 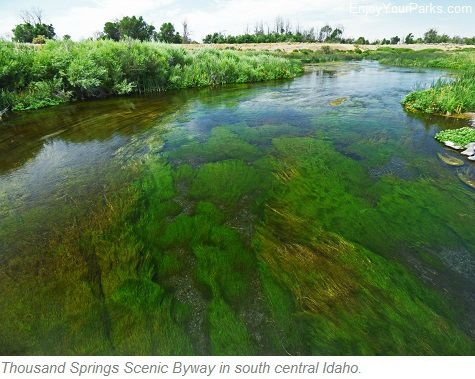 The water is pure, oxygenated and stays at a constant 58 degrees F. In fact, in this 30 mile stretch along the Thousand Springs Scenic Byway, nearly 70% of all the hatchery trout grown in the United States are from this area! And make sure you stop and say hello to the Miracle Hot Springs Alligator. 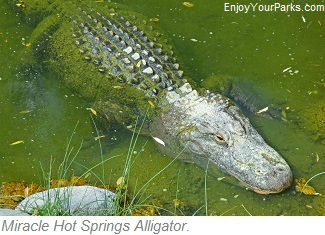 This famous alligator is a south central Idaho icon that has lived at Miracle Hot Springs for a long, long time. 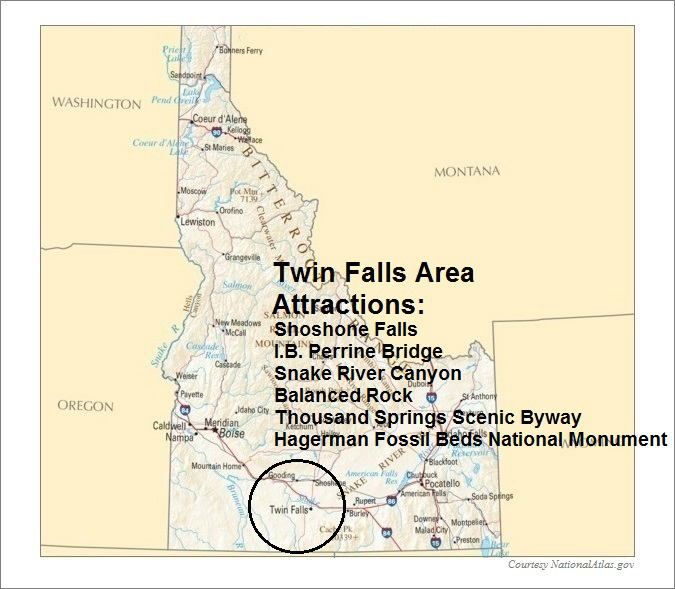 The Thousand Springs Scenic Byway also takes its travelers through the Hagerman Fossil Beds National Monument (see below) and the Thousand Springs State Park Complex before it ends near the town of Bliss on Interstate 84. One of the many springs along the Thousand Springs Scenic Byway in Idaho. horse fossils in North America. 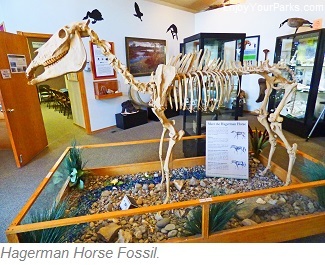 These fossil horses have been found in only one location, known as the Hagerman Horse Quarry. 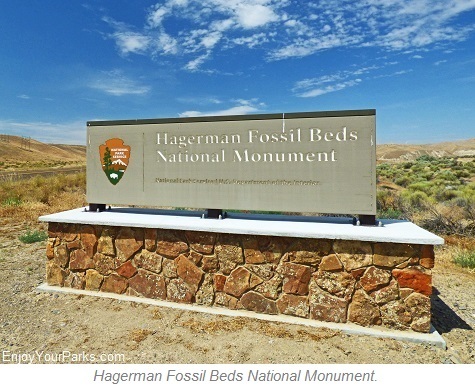 The 4,360 acre Hagerman Fossil Beds National Monument is significant world wide because it protects the earth's richest known fossils from the late Pliocene Epoch, which occurred 3-4 million years ago. The animals and plants deposited here give us the very last look of the era just before the latest major Ice Age, and just before the earliest appearance of modern fauna and flora. And also during this period, on a different continent, were the early stages of the evolution of man, and knowing what types of flora and fauna that existed during this period is of vital importance to the study of man's evolution. There are many species of animal fossils found in the Hagerman Fossil Beds National Monument near Hagerman, including the Hagerman Horse (Equus simplicidens), camelops (an extinct North American camel), mastodons, saber tooth cats, bears, ground sloths, fish, frogs, voles, beavers and bone crushing dogs known as Borophaginae. All told, over 200 species of plants and animals have been found in the fossil quarry! Nearly 3,000 new fossil fragments are discovered each year in the Hagerman Fossil Beds National Monument. The Hagerman Horse, Equus simplicidens, was the first true horse found on earth and is native to North America, but interestingly its bones look very similar to Grevy's zebra bones. Along the Thousand Springs Scenic Byway, there are several pullouts showing you where the fossil beds are located, as well as fascinating history of the California Trail. There are several interpretive signs that explain what you are looking at and are quite interesting. 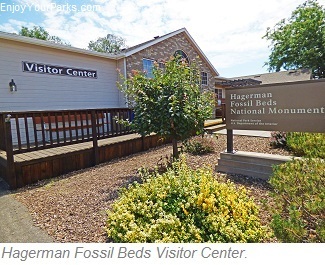 Once you reach the town of Hagerman, you will find the official Hagerman Fossil Beds National Monument Visitor Center, which is extremely fascinating and really brings it all home. So make sure you stop at this visitor center, especially if you're interested in fossils. 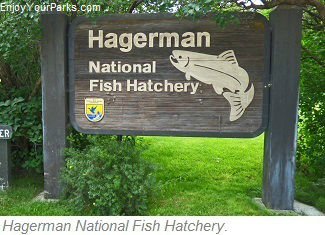 Hagerman Fossil Beds National Monument provides interesting interpretive signs.